Our Journey West: Where did Hans J. Hanson live? With no real plans for the day I was sorting through the favorites I had bookmarked on my Twitter account. I happened across a saved tweet from WI Heritage that linked to some early pictures of Richland County, Wisconsin. My Miller, Lindley, Tyler, and Hanson lines all have roots in Richland County, so I thought it would be worth a look. As far as I could tell, my ancestors weren't featured in any of the photos, but after a couple clicks I was staring at Richland County plat maps from the 1800's. 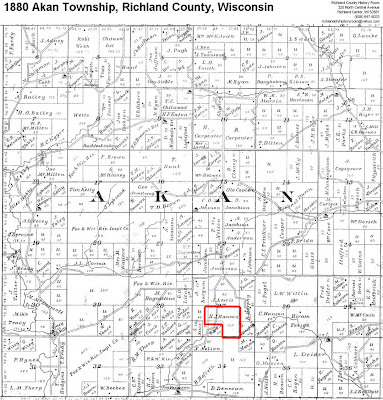 I was immediately drawn to the 1880 plat map of Akan Township because 1880 is the year I was able to find proof that Hans J. Hanson and his family were living in America. 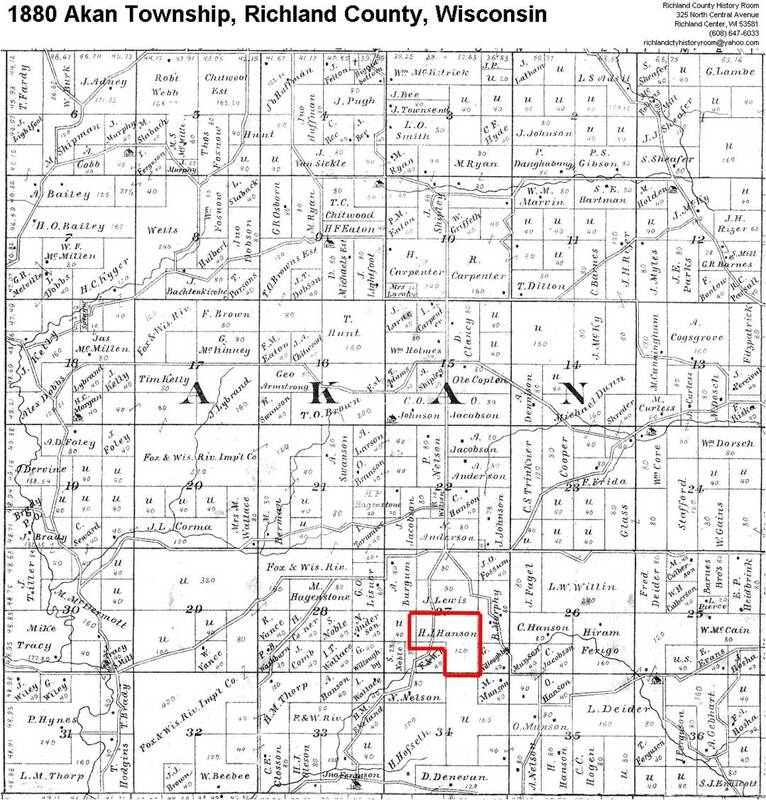 I knew from the 1900 U.S. and 1905 Wisconsin State Census' that my Hans J. Hanson was a farmer and owned land in Akan. The map isn't indexed so I sorted through each square looking for Hanson's. I knew it might be difficult to find my specific Hans Hanson as I knew their was at least one other Hans Hanson listed as a neighbor of my Hans Hanson in several of the late-1800 U.S. Census Records. Even with this against me, I was still able to locate two Hans Hanson's, one in Section 27 and one in 35. The one in Section 27 even said "H.J.Hanson"! I wanted to make sure I could confirm or eliminate one either the Section 27 or 35 Hans Hanson. I don't have any land records or wills, but I have several Census records and started with them. I sorted through the neighbors of my Hans J Hanson and noticed the same names coming up over and over again, but none in a particular order or location. (I've always wondered what path the census workers took.) Finally, I logged onto Ancestry.com and pulled up the 1880 U.S. Census (and others) and started going through additional pages until I found the other Hans Hanson. It turns out that the other Hans Hanson (who's wife was Mary) who had the same neighbors as the Hans Hanson in Section 35, which most likely means mine is really is the Hans J. Hanson in Section 27! I took the time to compare this old 1880's plat map with a map of today and am pretty confident I know where this is located. We have driven on the roads around this property and drive by the land when we pay our respects to the final resting place of Hans J and his wife, Antonette. Both are buried a couple sections south in Richwood Township, Richland County, Wisconsin. I even wrote a blog post about visiting them once. I can't wait to share this information with my family. Especially those who have taken the time to drive out to visit the graves of Hans and Antonette! I wish I had a trip planned to Wisconsin soon so I could see the land in person. I love adding chapters to this story. What a great bit of research! I haven't looked at maps yet but your post has inspired me to give it a shot. Good sleuthing. I love it that some of the states have started publishing old Township plots. It really does show who is where and sometimes if you get into a legal war over probate, guardianship, it tells you who the actors are and makes it easier to figure out who they are. Wow just by chance I ran across your blog while looking for Emma A. (Dean) Tyler. And I had been at a stand still also because of the MN Census. I got a alot of info I didn't have & cried when I read about teh info you found on Sylvia. I would love to get to Washington one day and see that as well. I see we come from the same Abel Royce Tyler blood line. His son, Nathan is my Great Grandfather. & I am also related to Hans & Antoinette (Hoff) Hanson. Again WOW what a great find. We need to talk more.